The purpose of the contest is to raise awareness regarding the core UN values of: Freedom, such as freedom from want and freedom from fear; Dignity; Solidarity; Justice; Protection; Human Rights; Security; Empowerment; Sustainability; Progress; Equality; and Peace. The contest is a chance for you to use your creativity to show UN values at work in your neighborhood, city, country or the Asia-Pacific region. The photos are totally up to you, just tell us which UN values they represent and write a short description about how the photo captures that value and you could be entered to win great prizes from contest sponsor Nikon! There’s also a viewer’s choice prize that will be awarded to the picture with the most likes on our Facebook page. So show us your stuff and enter today! It’s Your World. It’s Your UN! 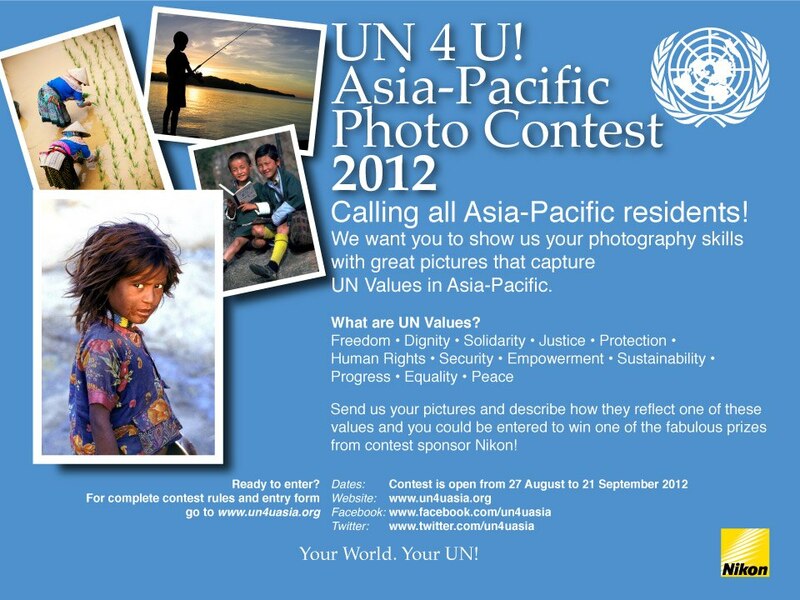 This competition is open to anyone aged 18 years old and older by the contest closing date of 21 September 2012, resident in any Asia-Pacific country. There is no entry fee of any kind. No more than three (3) photographs may be submitted by any one person. All photos must be accompanied by a caption and descriptive information about each shot. This must include title, date and location where the photo was taken and caption. The Small Earth Nepal (SEN), the Consortium for Capacity Building (CCB) at the University of Colorado and the Asia Pacific Mountain Network (APMN) of the International Centre for Integrated Mountain Development (ICIMOD) are organizing the ‘Asia Pacific Graduates’ Youth Forum on Green Economy’ in Kathmandu, Nepal from 25-29 September, 2012. 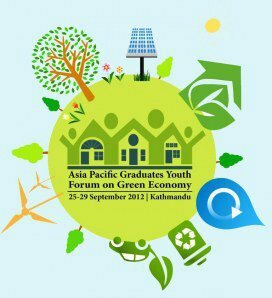 Asia Pacific Graduates’ Youth Forum on Green Economy which is going to be held on 25-29 September 2012 at Kathmandu, Nepal, is a regional scale workshop focused on capacity building of the dedicated youth leaders from Asia Pacific Region engaged in sustainability issues. The five-day long program will contain capacity building and knowledge exchange sessions, leadership exercises and excursions to nearby environmental projects. The workshop is aimed to share the ideas, experiences of technological needs for achieving sustainable development in the line of green economy. Applications from Youth aged 18-30 with an academic or a professional degree in the related fields from the Asia-Pacific region are eligible. Those who have already shown their leadership in green economy sectors are strongly encouraged to apply. Application Deadline is 17 August, 2012.